I was not part of the #cheeseslut tweeting as at that stage, twitter was something I knew nothing about. However, I read about this on Marisa’s blog and so decided to make a few cheese based dishes. This dessert is easy to whip up – the hardest part is cutting the figs! 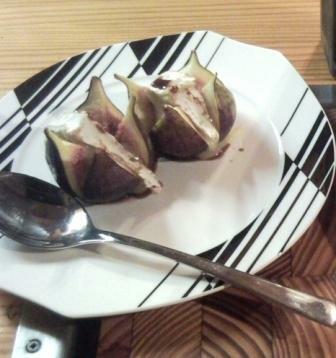 I love the combination of Figs With Camembert. We grew up with a fig tree and I can clearly remember having to get to the figs quicker than the birds did. We would pluck the ripe fruit off the tree and eat as many as we could in an afternoon. I also grew up eating fancy cheese. Camembert is one of my favourites, only after brie. I love the silky soft texture of the Camembert and it is one of those cheese that melts well. Cheesesluts forever! This is such a simple one, but so good. YUMMY …. add a bottle of fab vino ……. jan reaches for ANOTHER tissue and blows for the terabillionth time ……….. my snot glands work well hey!!!!!! some nice honey wine would be perfect – and hope you feel better soon! It’s actually also perfect as a lunch dish on its own. that does sound perfect! Friday greets back!